I left my house at 4:00 am and drove to Yosemite National Park arriving around 7:00 am. I parked in the trail head parking lot which is about a half a mile from Happy Isle (shuttle stop #16) or about 3/4 of a mile from Curry Village. This is a moderate to strenuous hike with a 400 feet elevation gain to the footbridge or a 1,000 feet elevation gain via the Mist Trail to the top of Vernal Fall. 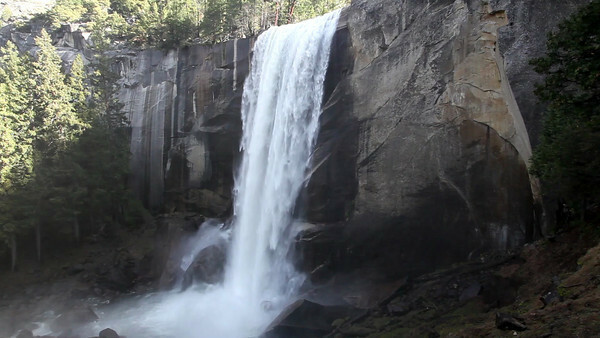 I took this video just passed the Mist Trail and short of the last 1/10 of a mile to the top of Vernal Fall. This video is of the spring run-off in mid April 2013. The volume was impressive even though the snow survey for April 2013 showed a water content for the Merced drainage at 53% of average. You will get wet hiking up to this location so a poncho or plastic garbage bag will keep you mostly dry on the upper portion of this hike. If you hike in the warmer months with similar flow, you might accept the cold spray after a strenuous hike getting there ! The sound recording of Vernal Fall was done with a Zoom H4N in stereo and it was edited in to this video because the 5D MKII microphone could not capture the volume and force of this incredible water fall. Vernal Fall is a 317 feet waterfall on the Merced River just downstream of Nevada Fall in Yosemite National Park, California. © Copyright 2013 Jerry Gilligan All Rights Reserved.